A lot has been happening and we have been so busy it seems the only time to escape and get some information out is getting on a plane. (And that is quickly disappearing with in flight internet, luckily not available on today’s flight…). A few things have been happening since I last blogged and it’s time to give a quick update. We brought 2.6 out of beta just in time for Astricon 2009 two weeks ago. This was a particularly exciting Astricon. 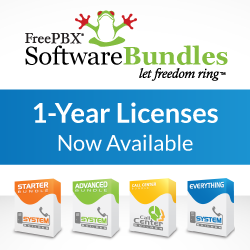 It was both the 10th Anniversary of Asterisk and the 5th for FreePBX. We hung out on the exhibit floor in our Open Source booth with some great props (thanks Sledge!). (I’ll try to get some pictures up here in the next day or two). The 2.6 release had over 6000 users at the time we took it out of a release candidate! (I still need to generate the final tarball and update the site in a few place, sigh, but you can update through the online Module Repository for now) It contains quite a few new features and a handful of “hidden” changes that I always refer to as internal plumbing upgrades. One change we introduced is the Extended Repository. This provides a mechanism for us to expose some of the more common “un-supported” but otherwise popular modules that are part of FreePBX but have required finding them and manually installing them in the past. There are also a handful of new modules so if you haven’t upgraded yourself from 2.5 or earlier releases, several thousand of your fellow community members should have paved the way for you to have the confidence of pushing that upgrade button. We are also excited to push out a new module that interacts with our FreePBX.com SIP Service, SIPSTATION™ that is available for purchase online. The service has been really well received and has been a great way to get access to the best SIP Service available (powered by Bandwidth.com’s purpose built VoIP network) and support the project at the same time. You can now use our new sipstation module to auto configure your services once purchasing them online from the portal. In it’s first version, the module provides a very easy ability to connect to our redundant gateways, provide realtime diagnostics on both server side and client side status, and a central dashboard and control point to easily configure your service into existing outbound routes as well as setup your DIDs and outbound CIDs, all in one central location. It even has a really nifty Firewall Test diagnostic which helps you determine if your RTP media ports are properly forwarded from our firewall, since most of us put our systems properly behind a firewall and have to deal with the realities of NAT. This is the first step in closer integration that we will build on bringing client side control of services that you obtain through our offerings. We will expand on this to bring features like PSTN failover numbers per DID directly configurable from within FreePBX and other ideas that are on the drawing board. If you haven’t tried our service and you want to make your life easier, here’s another reason to give it a go! On the FreePBX v3 front, a lot of progress is being made though it continues to be in a developer release state. The Asterisk driver is well on its way and work continues on both the Asterisk and FreeSWITCH front. This has been really exciting as it’s an important milestone in proving out the design of writing a GUI and framework capable of supporting multiple engines, a goal that has been in place since early 2006 when AMP was renamed to FreePBX and introduced the first generation of modular architecture present in the 2.x version. For now, it’s time to sign off (at least that’s what the flight attendants are telling us, in preparation for landing…) If you haven’t pulled the plug and upgraded to 2.6, now’s the time! If you want to hop on the development train of v3, come chat in the #freepbx-dev IRC channel. Lastly, if you want to see a really cool module (which is just the beginning), go sign up for some service, get your keycode and activate the SIPSTATION™ module to get a glance of the ease of use that tight integration can deliver!